To steal soon into a Lady’s Heart. The Crown doth stoop to th’ Maker of a Shoe. In the Middle Ages, tradesmen formed guilds that protected their trades. Those who worked with fine leather were known as Cordwainers, named after the very finest leather that was imported from Cordoba, Spain. 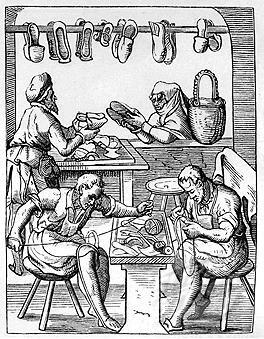 In later years, those who processed leather formed their own guild, but shoemakers retained the name of Cordwainer. 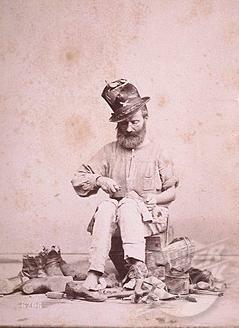 Cobblers were distinct from Cordwainers, for they only repaired shoes, but over the years, this distinction began to weaken. 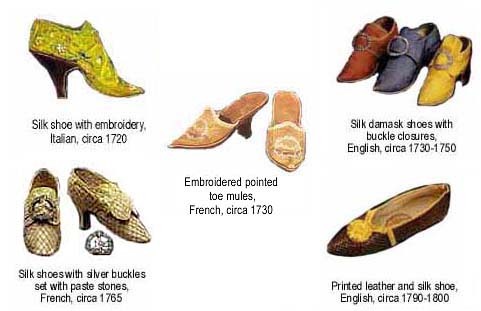 – Cordwainers: History. 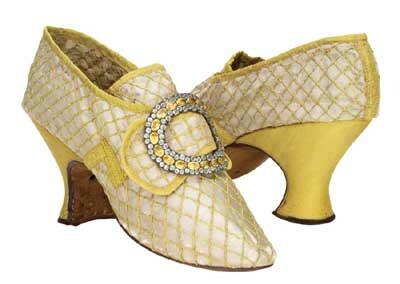 After the French Revolution, shoe heels began to disappear, symbolizing that everyone was born on the same level. 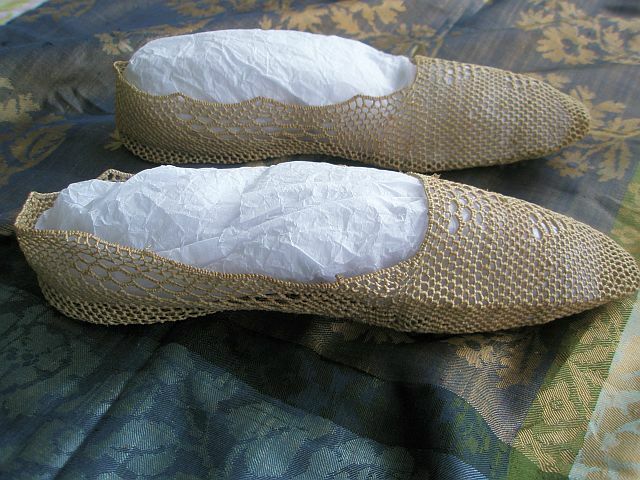 Delicate silk uppers began to be replaced by more affordable, sturdier leathers. 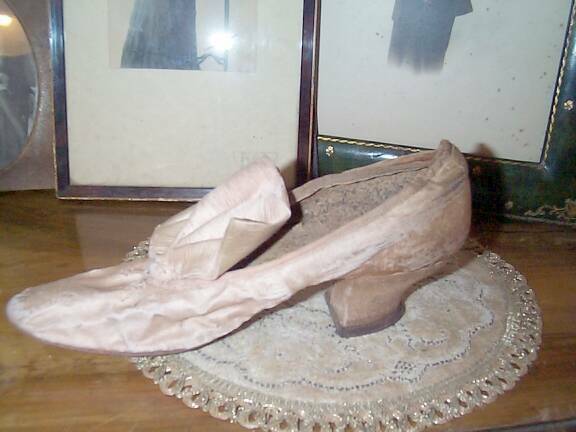 1891 silk shoe made with straight lasts***. 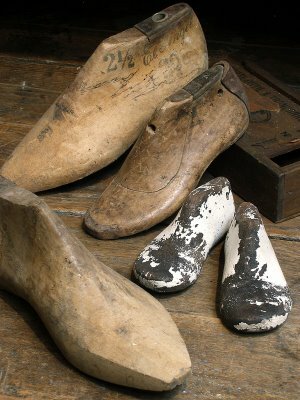 But the shoes continued to be made with straight lasts, a technique that continued into the 20th century. 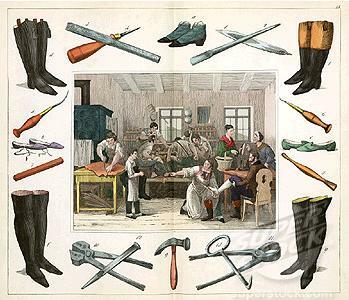 Tools used by bootmakers and cobblers included: awls for punching holes in leather; hot burnishers that rubbed soles and heels to a shine; sole knives that shaped soles; stretching pliers which stretched the leather upppers; marking wheels to mark where the needle should go throught the sole, and size sticks to measure the foot. 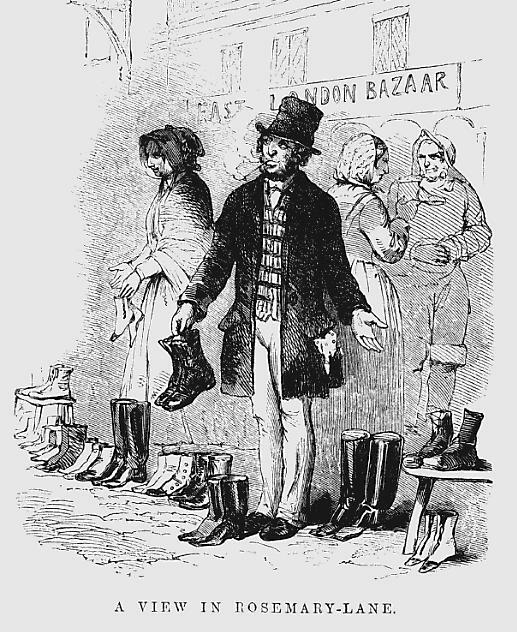 “By 1750 shoemakers were making shoes in different sizes for anyone who wanted to buy them. 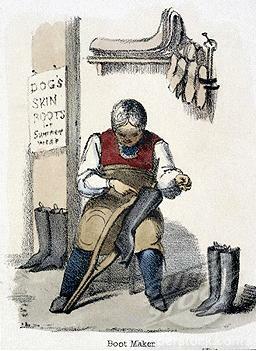 Before that they only made shoes on special order.” – Tradesmen/shoemaker. 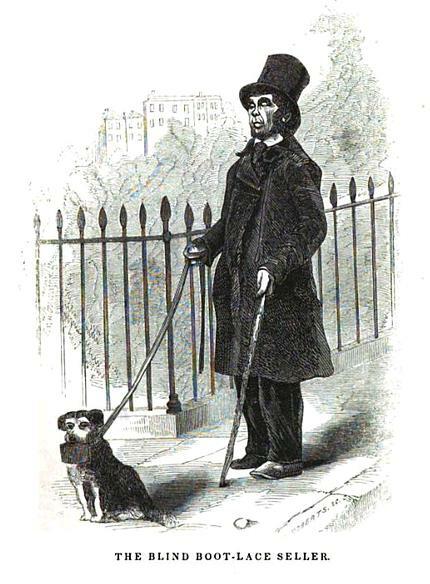 Pattens went out of fashion in the early 19th century. Jane Austen recalled their noise on cobblestones in Bath. It was common for women to trip while wearing this awkward device. Making mid 19th century shoes. I appreciate the picture of the patten. I’ve read a lot of descriptions but never seen a picture and it’s different than I thought. You know what is funny to me is how certain styles either seem timeless or seem to come back. My boots have a heel like the yellow silk shoes—they start wide, taper, and then flare for a solid, flat heel. Interesting article, as always, Vic. I don’t know how you do it, Vic, but I’m glad you do! You do all the work, and I just visit your blog and take it all in. I’ve always wondered just what pattens looked like. Most of the shoes I see from the era look as if they might have fit my feet when I was about 7 years old! Oh if only the shoes in my closet matched the shoes in my mind! ha ha Great post, very interesting! Such a great article! So fascinating and the variety of colors and textures, styles, sizes, heels etc. I enjoy your research and ability to make it interesting when you put it to paper and the photos etc are just something to behold. This is ever so interesting, Vic. Northampton was one of the main shoe making centres in England because there was a huge cattle market in the city. Clerks shoes, which is a thriving company today in England, began in Somerset. Two brothers began the firm. One was a tanner of leather and the the younger brother, looking at all the leather off cuts one day, had a brain wave. Clerks are famous for making very good quality children’s shoes. Every high street in England has a Clerks shoes.Towards the end of the school Summer holidays every Clerks throughout the country has mothers with their children trying on and buying new shoes for the new school year. It’s one of those quaint English traditions. I never realised that straight lasts were used, and as late as that too. Surely though, even in Georgian times, bespoke shoes and boots were made on left and right lasts? This article holds a special interest for me as my dad was a shoe repairman from the mid 40’s until he finally sold his business in the 90’s. He had a large collection of lasts (some of which I still possess), hammers, awls, knives. and machinery, the largest of which was the “finisher”. It was probably 8 feet long and took up an entire wall of his shop, which was in our garage. It had a series of rotating wheels with various grains of sandpaper mounted on them to “finish”, or smooth, the edges of the soles and heels after they were applied to the shoe or boot. It made an ear-splitting racket to be sure! I have fond memories of visiting daddy while he worked. And the smells–shoe polish, leather, rubber cement. Dad did the best work in town! Thank you for sharing this insight, Bonnie. What a lovely memory. It included sound, sight, smell, and a parent. It couldn’t be more perfect. And thank you, Vic, for your kind words. Loved the stuff about shoes–.